Time.com has an item today on the dust storms in Beijing: “Beijing residents awakened Monday to skies the eerie yellow color of a street lamp. It was the second time in three days that the Chinese capital had been scoured by sandstorms that have hit 16 provinces across west, central and north China, affecting nearly one-fifth of the country’s 1.3 billion people, according to the state-run Xinhua News Service.” (Read Beijing and the Onslaught of the “Mongolian Cyclone). You probably know this already, but in case you don’t – the US Embassy in Beijing has an Air Quality Monitor located at the Chaoyang District in Beijing (MetOne BAM 1020 and Echotech EC9810 monitors, reporting PM2.5 and ozone readings). 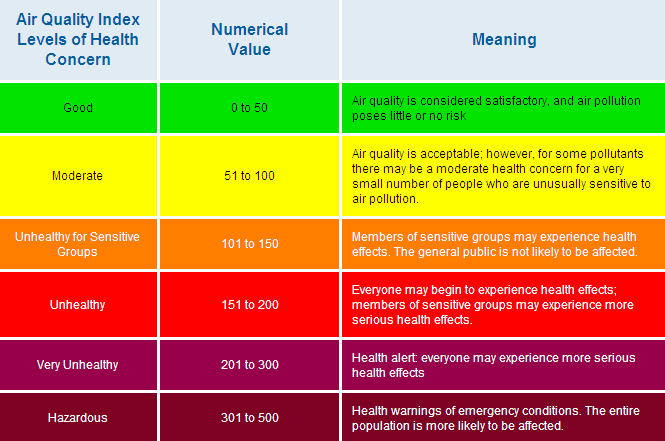 The AQI is an index for reporting daily air quality. It tells you how clean or polluted your air is, and what associated health effects might be a concern for you. The AQI focuses on health effects you may experience within a few hours or days after breathing polluted air. EPA calculates the AQI for five major air pollutants regulated by the Clean Air Act: ground-level ozone, particle pollution (also known as particulate matter), carbon monoxide, sulfur dioxide, and nitrogen dioxide. Read more on the Air Quality Guide Index here. Below are just the last several updates in the previous 24 hours from the monitor’s air measurements in Beijing. Format for each: pollutant type; concentration; AQI; definition. Click Twitter / BeijingAir here to get the most current data. Huh? News: Condi Rice admits some regrets over Iraq War? You can read the brief report here. No, she did not talk about those darn WMDs. But, um — ‘xcuse me – wasn’t it the tight “in group” in the US Government who have never been to war, who lived in a tide pool, armed with a shallow understanding of the region’s history who failed to understand the trick question of the century? Foggy Bottom certainly knew what was going to happen. Remember our folks there even wrote “The Perfect Storm” memo? No, it wasn’t written by George Clooney, silly! What, nobody saw that memo? Oh, what a shame …it was in the inbox! According to the book, Soldier: The Life of Colin Powell by Washington Post reporter Karen DeYoung, as the Bush administration was preparing for war with Iraq in late 2002, then Secretary of State, Colin Powell ordered Crocker and then Special Assistant to the Secretary of State, William Burns to prepare a secret memo examining the risks associated with a U.S. invasion of Iraq. The six-page memo, titled “The Perfect Storm”, stated that toppling Saddam Hussein could unleash long-repressed sectarian and ethnic tensions, that the Sunni minority would not easily relinquish power, and that powerful neighbors such as Iran, Syria and Saudi Arabia would try to move in to influence events. It also cautioned that the United States would have to start from scratch building a political and economic system because Iraq’s infrastructure was in tatters. Ah — lessons learned for reading/not reading the inbox?… consigning the memo to a footnote? What, it wasn’t in the footnote? Where … opps — what…?? In any case, it’s all history now for folks who did the war kumbaya. For those still fighting the war seven years on, it is as real as ever. Thousands dead forever lost. Thousands maimed will never be whole again. Apparently $747.3 billion spent and we’re not even any safer. Because dammit — it turned out Al Qaeda and Saddam Hussein were not BFF as we thought they were! Cake walk in the I-E-D park. “Made in China” security blankies. […] At first glance, this 12-story cube-shaped structure recalls countless other glass-sheathed office buildings. However, upon closer inspection other associations predominate. The embassy’s “ground” floor is elevated atop a bunker-like podium, the top of which is densely landscaped with grassy berms, trenches, and a water feature best described as a moat. The building’s square footprint, chunky massing, fortified perimeter, and relation to the river make it a twenty-first-century avatar of the Tower of London, several miles to the northeast on the opposite bank of the Thames. The building’s exterior cladding of glass—a material often equated simplistically with governmental openness—is treated with polymer plastic to lessen its projectile force in case of explosion. Similarly, the undulating earthworks at the base of the tower are meant to deter the advance of truck bombers. Given the likelihood of another al-Qaeda assault on the capital city of America’s principal ally in the Iraq and Afghanistan wars, such defensive measures seem only prudent, but the extensive checklist of protective requirements included in the design brief clearly had an inhibiting effect on even the most gifted of the competition’s entrants. With KieranTimberlake’s scheme, the costume has changed to the architectural equivalent of Kevlar body armor thinly disguised underneath a Tommy Hilfiger seersucker suit. No doubt to soften the new embassy’s Fortress America connotations, the architects have gussied up their presentation with crowd-pleasing environmental details of the sort that real estate developers throw in to gain planning approval for otherwise objectionable projects. Perhaps KieranTimberlake’s arboreal reference is Shakespearean. In Macbeth, enemy troops advance on the title character’s stronghold wearing tree branches to camouflage themselves, and thereby fulfill the cryptic prophecy that he will remain safe until “Birnam Wood do come to Dunsinane.” In Finnegan’s Wake, Joyce reframes that line as “a burning would is come to dance inane,” a not-inappropriate gloss on this tragicomic evidence of America’s postmillennial quandary in architectural guise. In case you did not see this — Nigeria has recalled its ambassador to Tripoli “after Libyan leader Moamer Kadhafi’s “irresponsible” suggestion that the country be partitioned between Muslims and Christians.” Until recently the chairman of the African Union, Kadhafi apparently proposed earlier this week that the best ways of resolving the incessant ethno-religious crises in Nigeria is for the country to go the way of Pakistan and India that separated and resolved their religious crises once and for all. This is way, way, WAY worse than what P.J. Crowley said from the podium weeks ago. And he had to publicly apologize for it? And he did not even use the “M” word for the munchkin! Is Libya now going to threaten to cut off oil access for Nigeria? Oh, wait, Nigeria has its own oil fields? Oh, drat! Apologies may not be coming anytime soon. Still, one never knows. Stranger things have happened in the world of diplomacy. Let’s see who will blink first this time.